Joe Dempsie stars in DEEP STATE as “Harry Clarke,” British, early 30’s and Max and Olivia’s son. He has spent much of his life denying his father’s existence, yet he still followed in Max’s footsteps as an operative in The Section. Harry is a gifted agent, but is his moral compass too rigid for this kind of work? 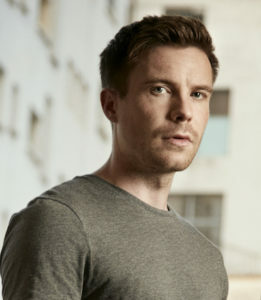 Joe Dempsie originally learnt his craft at the reputable Nottingham TV Workshop. Credits include British sci-fi film Monsters: Dark Continent, BBC drama Gamechanger opposite Daniel Radcliffe, cult teen drama Skins, and critically acclaimed This Is England 90. He starred with Jamie Dornan in New Worlds and has no fewer than seven BAFTA-winning shows under his belt. Joe has filmed Been So Long, a musical film released in 2018. Joe has starred in One Of Us for BBC One, and the feature length drama Ellen for Channel 4. He also appeared in a fantastic coming-of-age feature called Burn, Burn, Burn. In 2017, he returned as Gendry to the global smash hit Game of Thrones.